I'm so happy to finally share this cake with you because I absolutely LOVE IT!!! I had so much fun doing this illusion cake for Cake Masters Magazine but I had to keep it a secret until the magazine was released. And here it is! My Smoothie Bowl Illusion Cake!! Ta-da!!! How cool is it?? 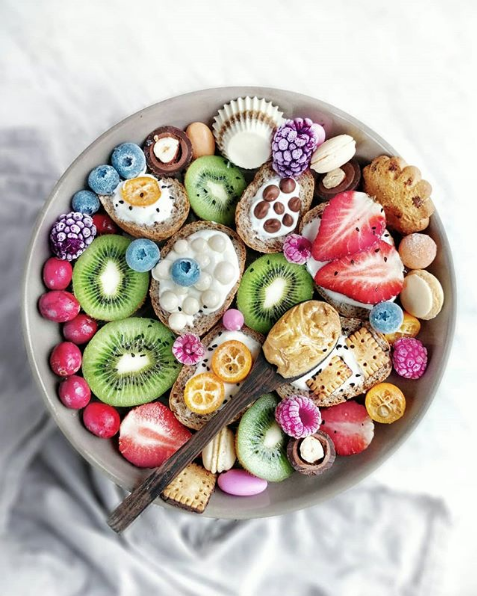 It's so colourful, happy and doesn't it look yummy too?? I've recently started to have overnight oats for breakfast and while searching for new recipes, I stumbled upon gorgeous images of smoothie bowls. After that, I got obsessed with them and with the possibilities, they create as a cake. A Smoothie Bowl is basically a ticker smoothie that you eat within a bowl with a spoon, instead of drinking it from a glass. Usually, it's used frozen fruits and vegetables to add the thickness and then you just continue with the normal smoothie recipe. This Smoothie Bowl Illusion Cake is work of patience, because of all the little details I had to do. It took me 3 days to make this cake, with all the experimenting for techniques and to try to get all elements as close to real as possible. I experimented a lot! With different tools, techniques and different paintings too. I'm not an expert at all with small modelling, so this was a big challenge for me. When I saw the final result, I was super proud of myself to accomplished something that I was not comfortable doing, and that also looks real! I start to follow a lot of Instagram accounts and hashtags because I really love the way these smoothie bowls look. So bright and pretty! 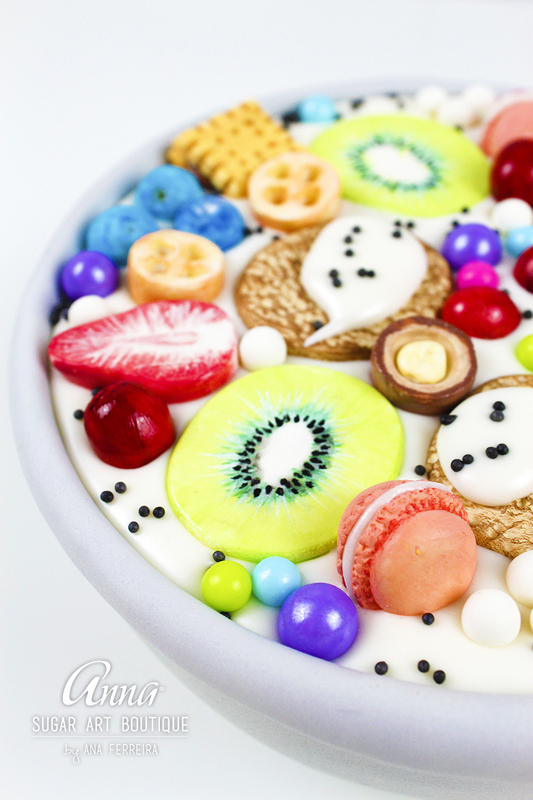 So I found this incredible image of a smoothie bowl and I knew it was this one! The owner of the account, Agata ☆ -food? -why not, is incredible with her food. You have to check it out. You'll want to eat them all!! I've started by doing everything with Renshaw Modelling Paste in white because I wanted for everything to set up really nice and smooth. I decided how many elements I wanted and what type of foods and started to work them with my Sugar Shapers from Innovative Sugarworks. They are awesome when adding details. When everything has dried up, I started the painting. I painted all the details for my Smoothie Bowl Illusion Cake with cocoa butter and Rainbow Dust Plain dusts. You can give a lot of realism with cocoa butter and you can have as many colours as you want because it's easy to combine different dusts in the cocoa butter. Also, it dries relatively fast, so you don't have to wait too long to add layers. It was time to assemble everything! And I was nervous, I confess. Because once I've started, I couldn't go back. Why? Because I used Renshaw Royal Icing to make the smoothie part. It adds the real look of creamy smoothie and shine and also glues everything together. Also, it's easier to use because it's already made! Just wiped a little bit with some water to create the right consistency and voilá! you have a royal icing smoothie. 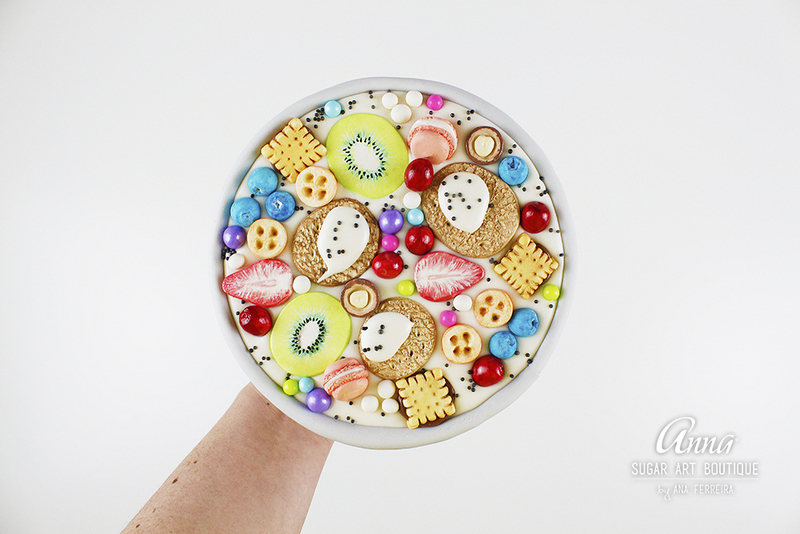 Add your toppings, by looking at the bowl as a piece of art. I was guiding myself by the original smoothie bowl, but the possibilities are endless! You can go in any direction you want. A little sprinkle here and there (I've used tiny black pearls to mimic chia seeds. How cools is that?) and it's done! Let your creativity fly!!! You can never mess with a Smoothie Bowl Illusion Cake. Start to practice with simple elements that don't have too much detail, and if you're not an expert with small modelling (like me), try to do elements there have more painting work. You can add a lot of details by painting. The main thing is to get as much close up photos of all the elements as possible, so you can see all the tiny details. Also, I was lucky to have most of the real fruits at home, so that's another great way to see how things are in reality. The big trick is in painting. The more time you spend on your painting, the more real everything will look. Now tell me, don't you want to go eat a smoothie bowl right away?? I know you do! Make one then. Or better, make a cake one. It's not as healthy, but well... It's cake, and cake makes you happy!!! ❤ This work was sponsored by Rainbow Dust, Renshaw and Innovative Sugarworks. Thank you so much for your support.